https://steemit.com/@mightypanda provided a solution to the same and won the bounty. I wanted to test the solution for various scenarios. Creating the inputs for the edge cases was very time consuming. I thought of using random generators for testing the same. So I started digging a little bit. There is no agreement on using random generators for testing. The argument against using random generators was that the test cases should be deterministic meaning that you should know what is the input and what is the expected output. While this makes sense from the test report and test suites, I though we could use randomised generators for inputs so that we can test the output for hitherto untested inputs every time we want. If used properly this method helps us increase the number of scenarios or inputs for which we can test. // Lets add another function which just calls getRandomNumber //function and prints it. I wanted it to work for positive numbers, one of the params could be zero and even for negative numbers. To find it out if it is truly random(oh I mean’t randomised enough) and if the edge cases are handled we will need to run this getRandomNumber function multiple times. What I mean by that is that if we need to be sure that start and end values are included in the random numbers that are generated the only way forward is that run the function enough number of times until the random number generated is same as start or end. I would put it as occurrence is the only proof that it will occur. So let us create a function which can call the desired function desired number of times. I got the following example from Stackoverflow. Ah that was simple enough. It would have been good if I had thought of it. I think I googled a little early. So this function uses recursion. Exit criteria is that times is not zero. Recursion criteria is that when exit condition is not met invoke the desired function and then call the recursive loop function with times variable decremented. That was simple enough, isn’t it? But we might have scenarios where we will need to pass parameters to the function in question as well. So let us modify our function a little. So we have added a third parameter to our loop function which will be an array of parameters. When invoking the desired function we are using the spread operatorthree dots to pass the params to the function. We just need to make sure that when passing the parameters to the desired function we pass it as an array of parameter values. Come to think of it, I think we should have named this function as repeat instead of loop. If we make the times to 100 or so it will be difficult for us to look at the values at one. So let us just create a concatenation function. // I know using global variables is bad. For now let us keep it this //way. Once explore the closures completely we can use it for this //scenario. So let us call the above function and with some edge cases and check. Using loop function we have identified the edge cases where our getRandomNumber is failing. This time I didn’t google. After some though I realised that it is all about getting the range. So I changed the function as follows. This seems to work for most of the edge cases. Do let me know if I missed something. Math.random gives random floating numbers between 0 and 1. So (parseInt(Math.random() * range) % range) will give us a random number between 0 and range. I am then displacing it by start to have the radom number generated between start and end. For this problem statement we know that we will have a flat json and the value of the pos attribute changes only one step at a time. So the increment is only in terms of -1,0,+1 In the solution provided by mightypanda getNestedJSON is the main function and createChild is used internally. Let us first define runTestforFixedValues function. These are like static inputs for the scenarios that we already know of. Let us check the output. The solution provided worked for all three input scenarios. Instead of creating more inputs like this. I spent some time on creating the random Flat JSON generator in the required format. I have created alphabetsArray that contains alphabets which we will use for text property. maxNumberOfElements is generated using our random number generator function. We know that between adjacent objects the value of pos changes only by -1,0,+1. So an incrementArray is stuffed with these values and we are picking one of these values randomly. 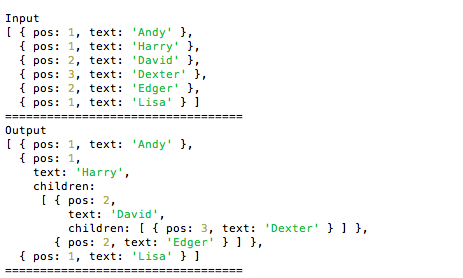 Let us say you want to create a deeply nested object, then increase the occurrences of +1 in this array. We can also make the text field of the object random as well. Since its value doesn’t affect the outcome, we are assigning alphabets in series to textobject so that it is easier for verify if the output is nestified properly. Take a look at the output below to see what I am saying. It is almost as easy as reading alphabets to check if the nesting is proper or not. Even if we had not sued the alphabets in series we could still ready the pos property in these objects to verify the nestifying operation. Whenever I came across an interesting pattern I just copy pasted the input array from the console and pasted it back in my code for runTestforFixedValues function. Very soon I had a big list of fixed input values like follows. We could keep repeating the process and increase our inputSets until we have a wide range of input values. So now we are able to test the code for various static input values. Every time we run the tests we can also look at some random inputs and verify if the output is expected. If you like that input or if you consider that is an edge case that should be tested in general then you can just copy paste that input to your static value testing method. Isn’t that cool? At-least I think it is. I find it very useful when I want to check the logic of a particular critical function. We started with getRandomNumber from the previous article. We used a loop function from SO and checked how it was implemented. We extended the loop so that we can also pass parameters to the desired function that needs to be invoked. We learnt using the spread operator. We used our loop to identify where all our getRandomNumber function was failing. We improved the logic of getRandomNumber to work for all the ranges. We tested out getRandomNumberand made sure that it works for all the ranges. We wrote runTestforFixedValues function to list some know edge cases and understand the nature of inputs. 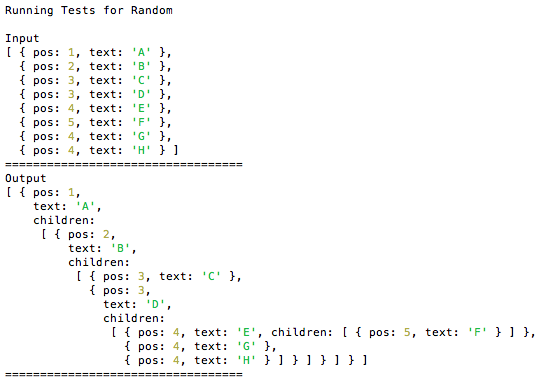 We created runTestforRandom function which generates a random flat json input for our testing. We used loop(runTestforRandom, 10); for running runTestforRandom 10 times.